You are a short bike ride from the Point beaches, Sunset beach and the state park. 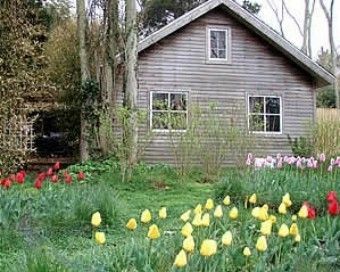 The house sleeps three to four comfortably with a an open airy high ceiling and you are right in the middle of Cape May Point's prime birding nature area. We are nestled away down a bamboo lane, our cottage has a loft bedroom and a huge great room with a newly renovated kitchen and bath. Birders and nature lovers alike will not want to miss spring and fall at the bamboo cottage. There is a private deck with its overhead pergola and gas grill. You just need to get on your bike and head down the road about a half mile to Cape May Point State Park to a private cove and beach. A private stay at the shore on a tree lined street. Scenic and Private with your own exit and entrance large deck with grill and seating area. The owner of this cottage, Mary Beth, was very accommodating and helped us to feel at home in her home. Of course, the Cape May Point area was beautiful and tranquil, but having a beautiful home to stay in there made it all the more enjoyable. This home is close to all the places we love; the lighthouse, Sunset Beach and downtown Cape May. We found this cottage had everything in it to make our stay comfortable.